An eccentric and challenging post-Metal band, BEYOND DAWN surfaced from the Oslo suburb of Kolbotn, manifested by the erstwhile EXCREMIST pairing of guitar player Petter Haavik and bassist / vocalist Tore Gjedrem, joined soon after formation by second guitarist Thor Arne Bergset and drummer Einar Sjursø. Prior to cutting their first recordings Sindre Goksøyr took over from Bergset. 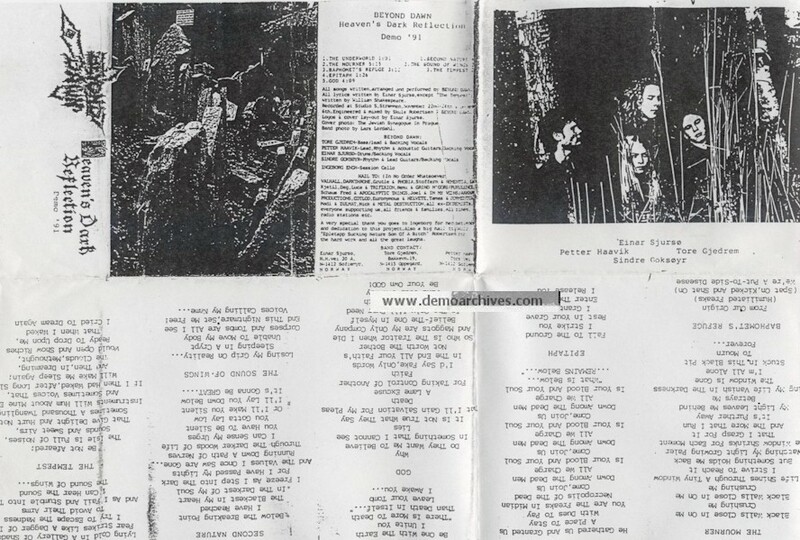 The demo tapes 'Tales From An Extinguished World' in December 1990, described by the band as "generic doom/death metal" and recorded in a kindergarten, and the May 1991 follow up 'Heaven's Dark Reflection' set BEYOND DAWN on their career path. 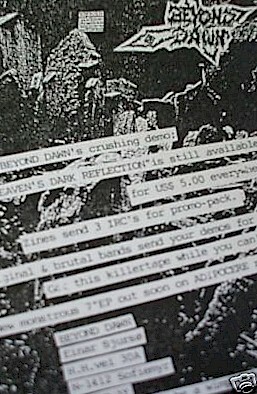 Next in line would be the issue of the 7" single EP 'Up Through The Linear Shades', recorded at Waterfall Studios with the song 'Bygone' featuring guest soprano vocals by Ane Hvesser. These sessions marked the introduction of new axeman Espen Ingierd. Prior to recording Goksøyr had left joining Industrial Pop combo PILEDRIVER and also enjoying a short term with GLUECIFER. 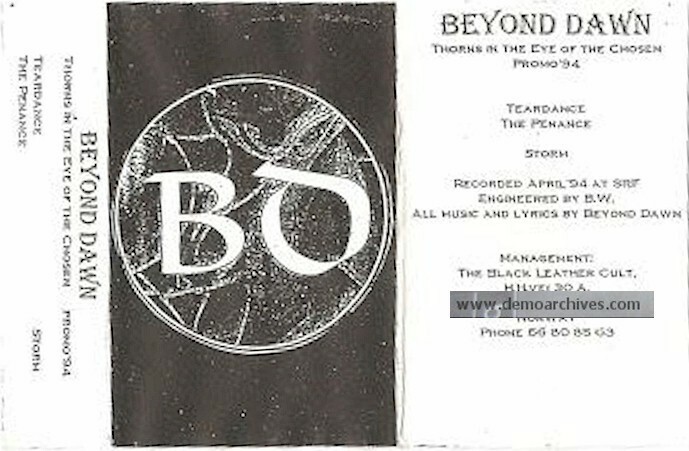 BEYOND DAWN's next move was to issue a four track record 'Longing For Scarlet Days' on Adipocere Records, recorded at Creative Studios and seeing the light of day in April 1994. On two of the songs Ingierd debuted as lead vocalist, his baritone contrasting Tore's shrieks and growls. It also introduced the trombone, played by Dag Midbrød. 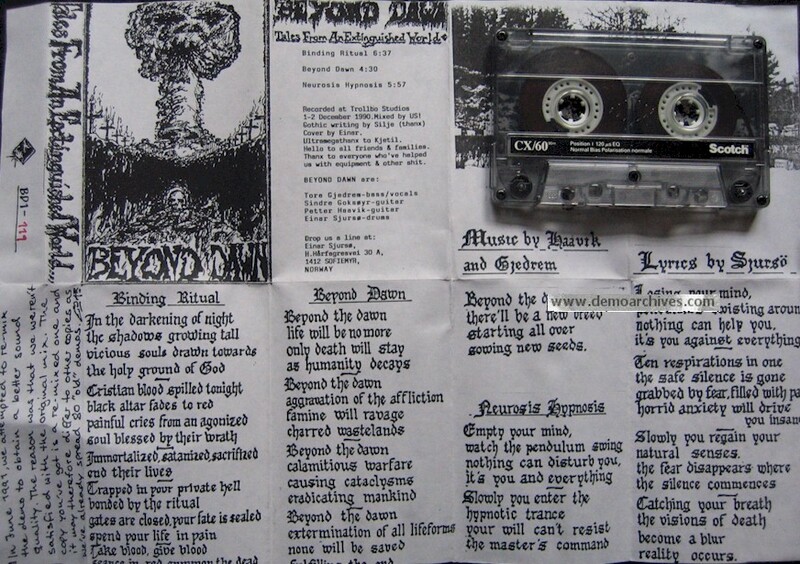 Simultaneous to this release the demo cassette ''Thorns In The Eye Of The Chosen' was distributed to various labels. Changing labels to Candlelight Records BEYOND DAWN released 'Pity Love' in November 1996. Both albums display a very original, depressive and bizarre mixture between Doom, Psychedelic, Gothic and Avant Garde Rock. 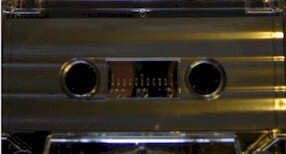 Xerox covers with regular tapes. Covers folded out for the lyrics. Xerox covers with studio tapes. Covers folded out for the lyrics. 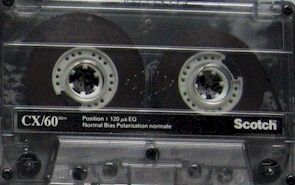 Xeroxed covers and regular tapes. 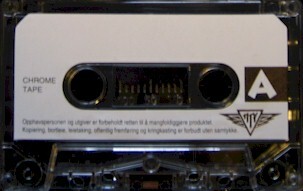 Pro printed covers on studio tapes. Demo recordings for their second album.